CLE Chele is one of the first hand-rolled premium cigars introduced to the cigar world by Christian Eiroa of CLE. These premium cigars are box-pressed infused with Nicaraguan binders and long-fillers bundled up to perfection inside a golden Ecuadorian Connecticut Shade wrapper. 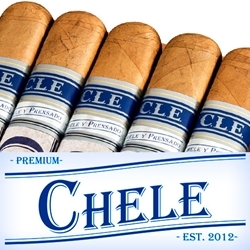 Every CLE Chele premium cigar is medium bodied offering a unique flavor profile that’s perfectly balanced with every draw, letting off thick clouds of creamy white fragrant smoke. The CLE Chele line are hand-rolled premium cigars that make an excellent choice for any cigar connoisseur. Smokers Discounts has made it easy and affordable to buy premium cigars online. A variety of sizes and flavors are listed below at our discount online cigar store. Each of these styles are in stock and available. Call us for more details!